When will I be able to place the puppies in homes? You can place most puppies in their new homes at around eight to ten weeks of age. 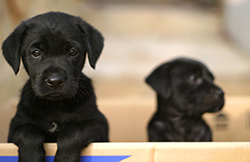 Puppies should remain with the litter this long to ensure proper weaning and social development. Puppies that are separated from their mother and littermates earlier than this may have an increased amount of behavioral problems. Should the puppies be treated for worms? "The common intestinal parasites are transmitted to puppies either across the uterus before they are born or through the mother's milk after birth." The common intestinal parasites are transmitted to puppies either across the uterus before they are born or through the mother's milk after birth. Puppies can be treated for worms as early as two weeks of age but it is more common to treat them when they are three and six weeks of age. It is important to weigh the puppies accurately so that the proper dose of medication can be used. What about vaccinations? Should I keep the pups until this has been completed? Puppies usually receive some protective immunity to the major canine diseases from their mother before and shortly after birth through the first milk orcolostrum. This is particularly true if the mother's vaccinations are current and she is healthy. Thesematernal antibodies protect puppies against diseases to which the mother is immune during the first few weeks of life. To help ensure that this protection is adequate, you should make certain that the mother receives any required inoculations prior to mating. Maternal antibodies only protect the puppies for a few weeks. After this time, the puppy becomes susceptible to disease. The duration that maternal antibodies last in each puppy is variable and depends on several factors. 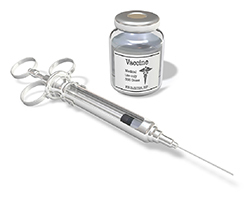 First vaccinations typically begin at 6-8 weeks of age, depending on individual circumstances. If your puppies were not able to nurse during the first three days of life, they will not have received proper immunity from their mother's first milk or colostrum. Similarly, if the mother dog was not up-to-date on her vaccinations before giving birth, she may not have passed adequate immunity to her babies. "...quarantine procedures may be advisable to lessen the chance of disease transmission to the unprotected puppies." In these situations, your veterinarian may recommend starting their vaccination series earlier, and quarantine procedures may be advisable to lessen the chance of disease transmission to the unprotected puppies. All puppies require 2-3 sets of booster vaccines as they mature, in order to develop active immunity against the common infectious diseases. Your veterinary hospital will give you the appropriate vaccine recommendations for your litter of puppies, based on their breed, risk and lifestyle. What about the mother? Do I have to do anything to dry up her milk supply? Starting at approximately three weeks after birth, as you start the weaning process, the puppies will gradually feed less and less from the mother's milk. She will be happy to leave the nest for longer and longer periods and, depending on her breed or type, will probably enjoy increased periods of exercise and physical activity. "During this time, her milk supply should be diminishing naturally..."
During this time, her milk supply should be diminishing naturally and you should start feeding her less. It is rare that medical intervention is required to reduce a mother's milk supply. Other handouts in this series contain further information about intestinal parasites, infectious diseases and vaccinations. Your veterinarian can provide you with this information and give you specific advice that relates to your circumstances. If you have any other questions, please contact your veterinary clinic.